A cornucopia of Christmas colours started slowly filling the dining table as many bloggers and top Zomato food reviewers began to feast with their eyes (and no doubt contemplate the Instagram photo possibilities). I had the opportunity to quickly quiz the chefs responsible for the deliciousness that was soon going to be part of the gorging ceremony. Chefs Jackie and Daryl were very gracious people. They’re two very passionate individuals who share an admirable modesty about their skills, knowledge and talents. Chef Jackie has been a dumpling chef for over a quarter of a decade (26+ years). Both chefs noted that the inspiration for this month’s entrée specials at Tim Ho Wan were inspired by the colours of Christmas: think Santa Claus and Christmas trees. 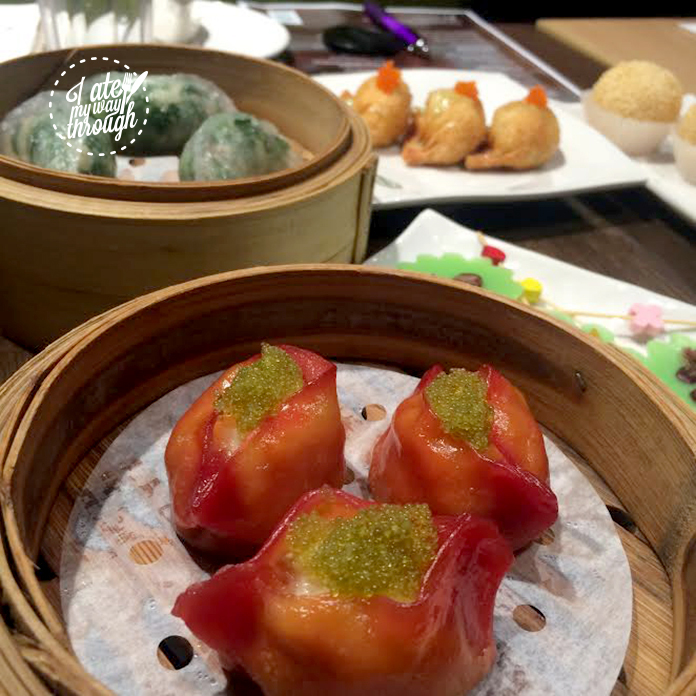 The specials included two savoury options (each come as three portions – $8.90) — spicy tom yum goong prawn dumplings, and beetroot-infused pastry filled with prawns and topped with wasabi tobiko (flying fish roe). The pandan pudding pops with red bean, cranberries and dried apricots were the third option (three portions – $6.90) -– for those wanting a sweet start to their dining experience. 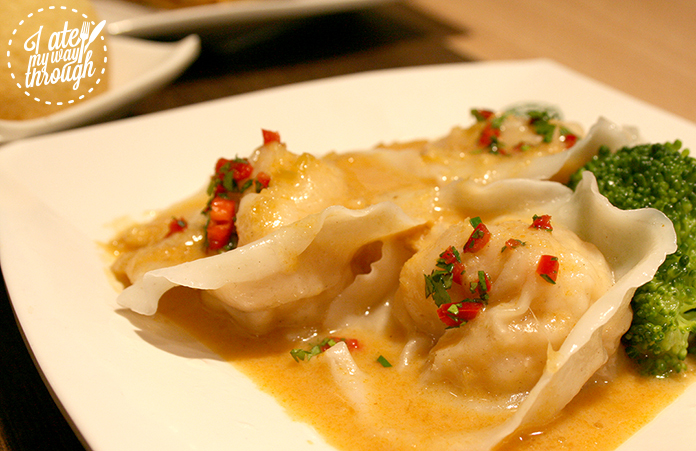 Tom Yum Goong prawn dumplings with capsicum topping. The tom yum goong prawn dumplings were dotted with finely diced capsicum and had a rich, yet light, tom yum goong sauce poured over them. This combination was an exotic and aromatic sensation I didn’t expect to be at the flavour party, but my taste buds welcomed the dish warmly. Beetroot-infused dumpling parcels filled with juicy prawn and wasabi-washed tobiko. Beetroot was chosen by Chefs Jackie and Daryl to make the pastry blush in the presence of juicy prawns and the wasabi tobiko. I think it’s important to note how much I dislike wasabi here. As I inhaled each crimson parcel, I didn’t realise these were the wasabi-topped morsels that I was preparing to avoid. There is only a hint of wasabi flavor and it’s the subtlety of this combination that increased my respect for the chefs at Tim Ho Wan. If your sweet tooth is a bit on the shy side, then the pandan puddings with red bean, cranberry and dried apricot are a win. These brightly-coloured puddings are a lovely entrée without overpowering the meal to come. Chefs Jackie and Daryl noted that this is a dessert traditionally flavoured with coconut but they captured the Christmas spirit by using pandan to add a lively green to it. 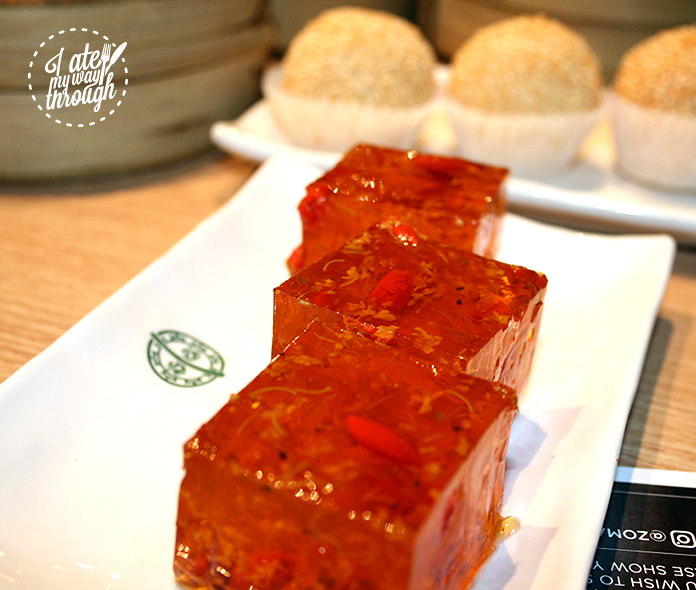 A delicate tea-flavoured jelly with chrysanthemum and goji berries. 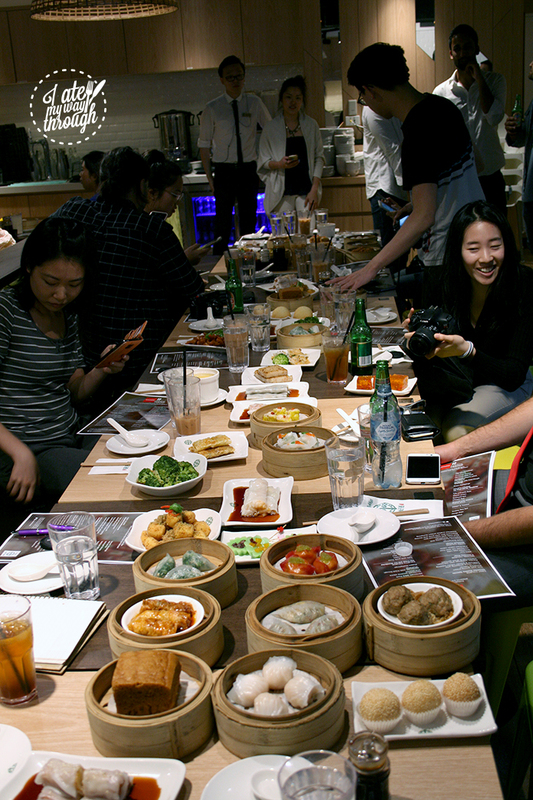 With so many choices available at the Michelin-starred banquet prepared by the talented Tim Ho Wan chefs, the party in my stomach was popping and not stopping. Honorable mentions include the steamed egg cake, radish cake, and the barley drink that was by my side the whole way through. The barley drink had a neutral yet delicately sweet taste that helped cut through the many flavours I had to meet that night. It was the perfect company. And, as for the steamed egg cake ($5.90 per piece), what a delightful slice. When it arrived at the table it was unassuming in appearance, looking like a simple sponge. I thought that it might be egg-flavoured and admittedly wasn’t going to try it. I’m deeply grateful for the encouragement of my fellow Zomato-ers because without that, I wouldn’t have been able to enjoy what tasted like a sweet, maple-infused pillow. Lastly, the radish cake. 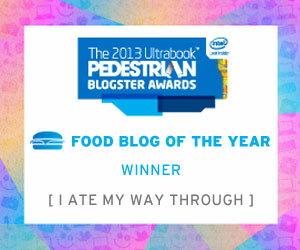 Please eat it. If you like rosti, then you’ll really like this steamed, semi-charred, and less oily version of the Swiss hash potato. And, its made from radish (and peppered with pork) so it doesn’t feel too heavy. Zomato meetup group excited about the abundance of food on the table. I arrived at Tim Ho Wan with no expectations (aside from the fact that it’s Michelin-starred). I’d never eaten at the renowned restaurant before, and was privileged to be included as part of the #Zomatomeetup group experience. But, after undertaking the feat of trying over 20 dishes and struggling to find room for more, it was time to say goodbye to a lovely night in the company of those who appreciate the joy of eating good food. Tim Ho Wan really impressed me and went above my expectations, so in the words of the T-800, “I’ll be back”. 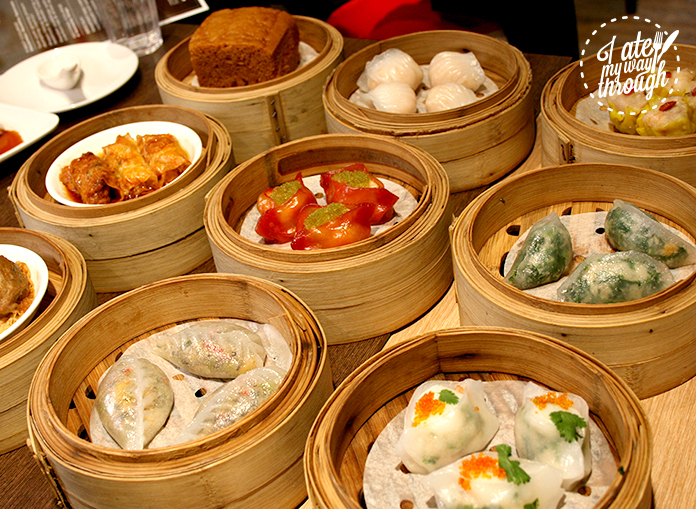 Be sure to check out the Christmas-inspired menu at your nearest Tim Ho Wan. As a self-proclaimed MacGyver-style cook, Alexandra has brought people to tears with just a slice of well-prepared frozen pizza. She's a web producer by day, and moonlights as a DJ/host for a YouTube cooking show that doesn't exist.